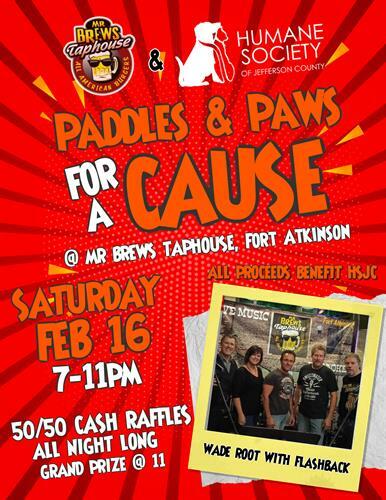 The Humane Society of Jefferson County is hosting a fundraiser at Mr. Brews in Fort Atkinson on Saturday, February 16 from 7-11 p.m. There will be 50/50 cash raffles all night long with a grand prize awarded at 11:00. In addition, Flashback, featuring Wade Root will be entertaining guests with their incredible talent playing the best music of the 70’s, 80’s and 90’s and today. Stop by for great food, great drinks, and great music all while supporting the Humane Society of Jefferson County!